This piece was originally published on Harvard Business Review. How often is your sales team making important decisions based on gut feel? Are you sure that deal will close this quarter and was it optimally priced? Are your sales resources allocated properly to drive growth? In my experience, when sales organizations make major decisions and plans based on gut feelings, there are costly consequences. One company missed its fourth-quarter forecast by a significant amount and had to reset all quotas for the next year, delaying quota distribution by several weeks. Another sales team relied too heavily on experience and judgment to make pricing decisions for large deals and left millions of dollars on the table. One company failed to leverage its data on relative productivity of sales reps across geographies and inefficiently allocated scarce sales resources to the right growth opportunities. In a world where data is everywhere, too many companies fail to take advantage of the power of data and analytics to fuel sales performance improvement. Why does this happen in so many companies? Historically, sales has been labeled an art. Selling revolves around people, and with that comes emotion, beliefs, opinion, and the careful management of relationships with customers, partners, and others within the sales organization. Accessing data, and figuring out what to do with it, has been a difficult endeavor. However, with more modern business intelligence platforms emerging, and easier access to sales performance data, the application of science to selling has become a key differentiator in managing the sales organization. Companies that embrace data and analytics as the foundation for sales planning and performance management will achieve breakthrough improvement in sales productivity. Improved pricing and discounting: Many sales reps and leaders are time-constrained and haven’t been trained to effectively apply data analytics to pricing decisions. Oftentimes, it’s faster and easier to just offer the same pricing to customers or use the floor of the discount matrix to speed up the customer buying process. Typically, sales reps don’t know that other reps in their organization have achieved higher prices for the same deals with similar customers. This is an area where data and analytics can yield several points of margin improvement. With an advanced analytics platform mining all historical sales data, sales leaders can see where they are pursuing suboptimal pricing and challenge sales teams to reconsider their deal structures. Better forecasting accuracy: Sales leader judgment can be an important ingredient in forecasting deals, but human judgment often fares far worse than analytical models in assessing the likely outcome of deals and sales teams. The data does not lie. By leveraging data points on opportunities (e.g., the customer’s historic buying behavior, sales rep performance, product type, and sales stage), a predictive model can actually deliver a more accurate forecast than traditional “roll-up” processes can. Using these types of analytical models can also save countless hours in management meetings trying to analyze human judgment and adding “manager overrides” to lower-level forecasts. Reduced customer churn: Armed with a comprehensive profile of customer behaviors (e.g., support incidents, attendance at training classes, and website engagement), sales reps and/or customer success managers can more accurately identify at-risk customers and take preventative actions to prevent churn. Marketing outreach can also be tailored to target at-risk customers and increase overall engagement. Establishing data and analytics as a foundation within the sales organization isn’t easy. Getting there requires leadership to invest time and resources into acquiring the right data, systems, and people to build these new capabilities. In my experience, it’s vital to build the right Sales Operations function with the charter and resources necessary to prepare and analyze data, synthesize the analysis into effective action plans, and drive change management across sales. These leading Sales Operations teams bring deep insight into performance improvement opportunities and become trusted advisors to leaders throughout the company. All of this is built on a solid foundation of data, from governance to preparation to analytics and reporting. Building a new capability to harness the power of analytics in sales begins with clean, prepared, and well-managed data. This data must come from a widely-adopted CRM system and should be analyzed by a robust, modern analytics platform. And as mentioned above, the right analytically-minded Sales Operations staff need to be in place to understand the data, glean insights from analysis, and recommend effective actions for sales leaders to take to improve performance. Enterprises already know the pain of disparate data sources, siloed departments, and legacy software—a broken infrastructure that hinders performance, growth, and development. Scaling advanced analytics enterprise-wide means having consistent definitions and sales practices. This also requires activating staff who will ask the right questions of data, perform analytics, and discern what must happen next. Globally, how is your CRM system being used? Is your account and opportunity hierarchy defined and structured the same way across teams—does “closed won” mean the same thing to your commercial sales team as it does to your enterprise team, to your teams in the UK and Australia, for example? Setting definitions and hierarchies within your CRM is a best practice that leads to cleaner data. Embrace an analytics platform with the capability to connect to your CRM and other data sources, which has intuitive data-prep tools and optimizes advanced analytics to provide a single source of truth. Then you can take advantage of modern business intelligence capabilities and scale quickly. Beyond standardization of data analytic definitions and processes, you need the right talent in place to set your organization up for success. Your sales operations staff are trusted advisors to the business and should have a seat at the table to support sales planning and resource optimization. For a true ROI in Sales Operations, they should not be relegated to back-office reporting but instead should have the organizational support and technology resources to apply advanced analytics. The right people, empowered with the right analytics platform, and backed by the right data, drives sale performance improvement. LinkedIn applied data and analytics to empower its sales teams with insights that drove success. Before, the company stored close to a petabyte or more of sales data using internal databases, Google Analytics, Salesforce.com, and third-party tools. One analyst serviced daily sales requests from over 500 salespeople, creating a reporting queue of up to six months, which left team members questioning their performance and the status of customer relationships. Today, 90 percent of LinkedIn’s sales force accesses the BI solution weekly. By tracking overall sales performance and digging deeper to understand the customer experience, sales now identifies when customers increase product usage and can proactively connect around opportunities to increase overall spend and avoid account churn. Setting up the right processes, systems, and people to acquire, prepare, and analyze key sales data will enable better decision-making for any sales organization. By putting data at the center of your approach to sales planning and performance management, you will also be able to realize a breakthrough in growth and productivity. 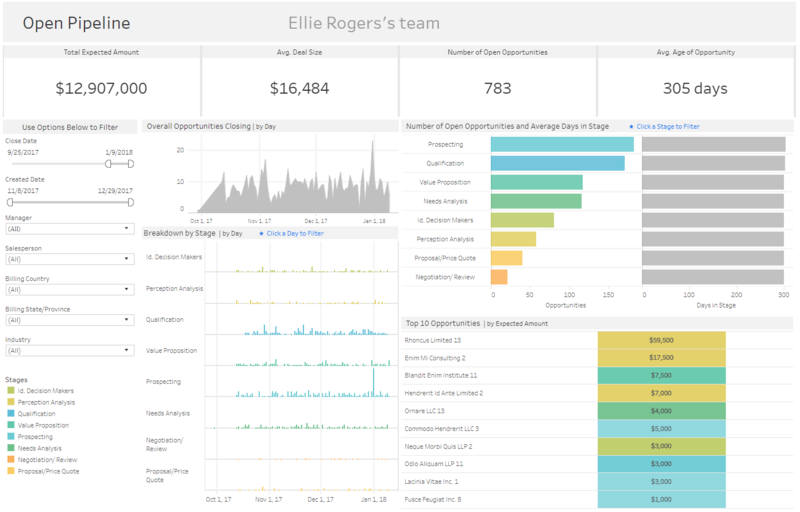 To leverage data analytics to prosper as a modern sales organization and bring more science to your selling, visit the Tableau Sales Analytics Solutions page. This one-stop resource for all things data and sales, will support new and better possibilities for your sales operations.